In this twenty-first century, digital trends have given rise to the rampant growth of social media platforms. No wonder, online socialization has become a cakewalk today. With just one click of the mouse, you can now get in touch with people hailing from different countries and diverse backgrounds. Are you looking for a social media platform that lets you connect and Chat With new friends online? Then you are at the place. 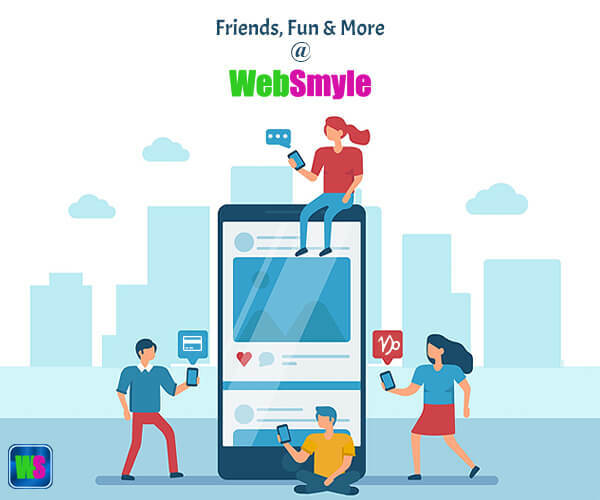 Here, we will tell you about WebSmyle, a promising virtual platform that facilitates the blossoming of new friendships. Recently, this online platform has been garnering substantial attention from people of every age for obvious reasons. WebsSmyle provides you with quality services that certainly give this platform an edge over other competitors. Mentioned below are some of these top-notch services this platform has in store for you. 1. Eases online bill payment process- With WebSmyle at your disposal, you do not have to feel anxious about an immediate bill payment online. Its user-friendly interface and security features enable you to make urgent payments at any place and any time. Moreover, its users can also keep an eye on all the records of their previous payments and bills with the assistance of this social-networking site. 2. Grab discount coupons- Apart from meeting new people online, WebSmyle lets you avail enticing discount vouchers. If you are a user of this social media site, you can win vouchers floated by this social media site. By grabbing these vouchers, users like you will be able to engage discount offers from restaurants, quality clothing brands, and movie show tickets. 3. A quick mobile recharge service- You can now enhance your experience of mobile recharge with WebSmyle. Not only can you store all your credit details on your WebSmyle account but also its Turbo recharge facility prepares for you a recharge list of your preference to carry out any transaction in future. All you need to do is to log in to your account and click on the recharge option for enjoying a swift mobile recharge service. 4. Diverse payment options- WebSmyle has its unwavering focus set on providing quality services to its users for winning their satisfaction. Due to this very reason, this social media platform has in place various payment options. From debit and credit cards to net banking, you can pick out any payment mode that you find the most convenient. 5. Astrological predictions for your future- You sure want to meet friends online through this platform but how about knowing astrological predictions based on your zodiac sign? WebSmyle brings before you this exciting service to turn your every day into a lucky one. Since these forecasts are available in various vernacular languages, you will face no hassle in obtaining accurate customized predictions in a language that you are accustomed to. Conclusion- Establishing friendships that cut across geographical barriers is longer unachievable. WebSmyle is one social-networking site that lets you make friends and further enjoy various other unparalleled services.